The venerable space at 35 Prince Street, at the corner of Prince and King, has played home to a variety of restaurants over the years, and Eat & Enjoy is the latest and, arguably, the most intriguing. 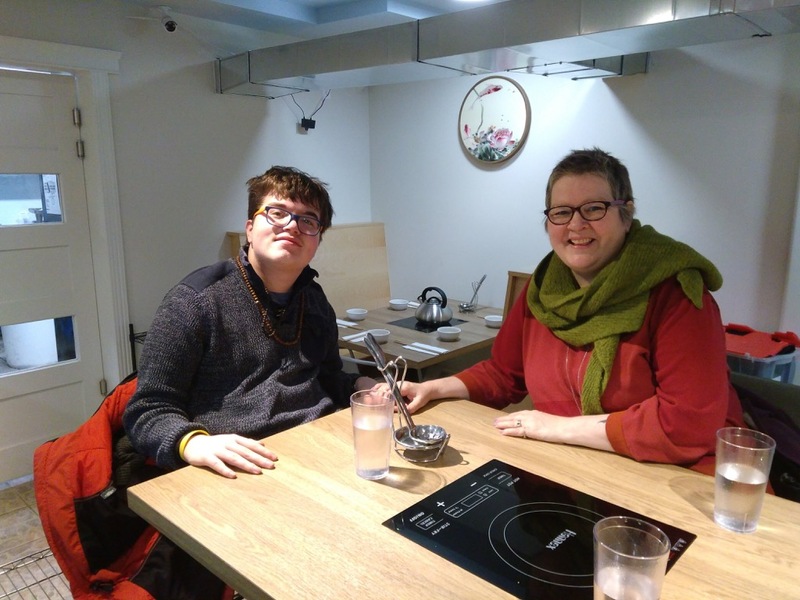 Eat & Enjoy’s specialty is the hot pot, a Chinese soup prepared at the table by diners themselves; they opened on Tuesday night, and we decided to brave the cold and have our first meal there, expecting that it would be empty, as the word wouldn’t have gotten out yet. We were wrong: the place was packed, and we were squeezed into the end of a table at the last three non-reserved seats in the house. Pick a soup stock: spicy, non-spicy, or half & half. Within the “spicy” category there were several grades of spiciness, starting with “regular spicy” and getting hotter from there. We opted for a “half & half” of non-spicy and regular spicy. Pick a sauce. There are three varieties of oil that come in a small bowl to which you can add ingredients from a central side-table. Because there were three of us, we chose one of each bowl. 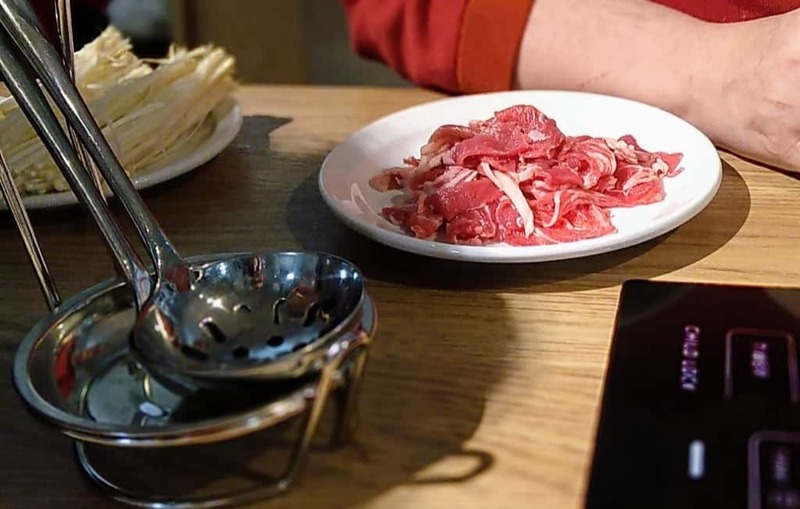 Pick ingredients to cook in the hot pot. These come raw, and you add them to the boiling soup stock to cook them. You can order a “combo” which comes with a set list of ingredients, or you can order them à la carte. There are a variety of meats, seafoods, tofus, vegetables, noodles and mushrooms available. At this point the ordering is done, and you wait to be served. Next you’ll be served one small bowl per person with an amount of oil at the bottom; you may be warned that this is all the oil you’re going to get, but that’s okay. Take your bowl over to the serving table near the kitchen entrance, and spice it up with a variety of fresh spices, salts and other things, to your taste. We were advised to place the ingredients in the boiling soup stock until they were cooked. And because we’d be handling the raw ingredients with the same chop sticks we’d be eating with, to sterilize the chopsticks in the boiling water before eating. 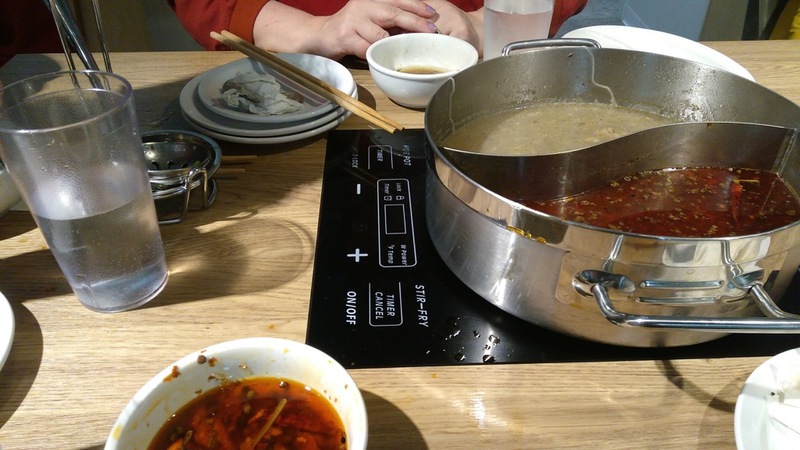 You’ll note that there are two ladles at each table; we found these very helpful for fishing the cooked ingredients out of the soup stock when they were cooked. When each ingredient is cooked–and they cook at different rates depending on the ingredient–fish them out and into your boil of spiced oil, and then eat and enjoy. Repeat as often as needed to consume your ingredients. 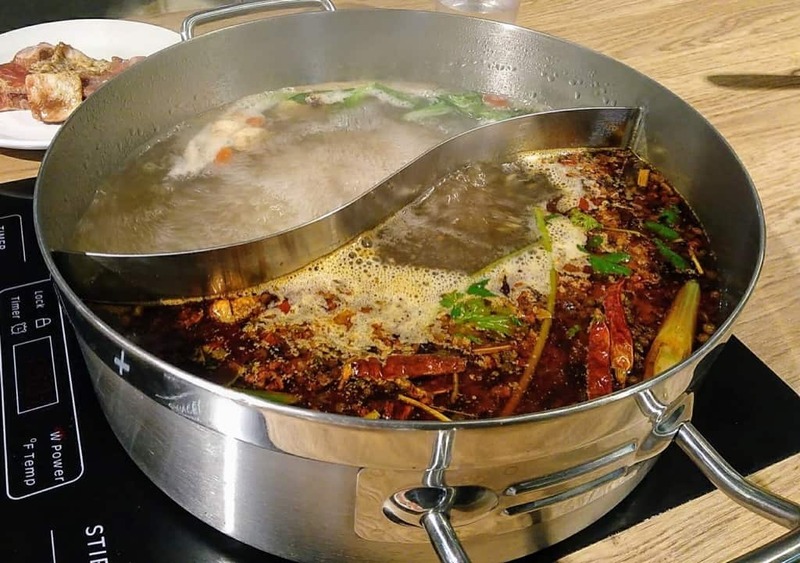 It seems the role of the pot of soup stock is most as a cooking medium rather than a “pot of soup” that you might be expected to consume all of; and the chili peppers, peppercorns and other spicy goodness in the regular spicy soup stock would be hard to consume in any case. We were in, boiled, cooked, eaten and home within about an hour, but we could have lingered longer if they hadn’t needed the table back. Eat & Enjoy might not be for everyone, but it’s something, I think, that every Islander should experience, as it’s as close to a total, albeit temporary, immersion in more traditional Chinese cookery and culture as you’re likely to find on the Island. Our bill for 3 people was $40.73 plus tip.